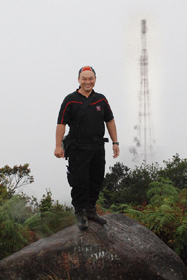 I remembered the first time I ascended Mt Ophir some 22 years back. There were just 2 of us, driven with audacity of being young and foolish. With much trial and error on the track, we finally made it to the summit after 10 hours. Adding to the foolish and ignorance, we camped right at the summit, oblivious to the fact that we could have been blown away by strong gust of winds or even struck by lighting. And we even brought really thick ropes measuring no less the an inch in diameter. We were ridiculed by climbers from a local adventure club on us intending to haul up an elephant with the rope! But we all learn from our ignorance. 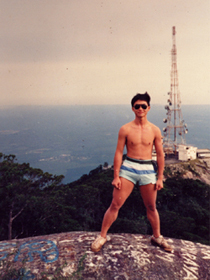 In the same year in 1986, I ascended a total of 4 times. Since then, I have ascended a total of 14 times. I was told by a local that going up to the summit is like a love affair. Once you have been up, you’ll always crave to go again and again. Whether there is any truth in it or not, it sure was for me. No matter how much I regret during every climb mid way asking myself why am I doing this, I still do it. And so now is no different. I was adamant about reaching the summit after 2 failed attempts in 2002 and 2004. My last ascend to the summit was in 1999. I have always known there is a road leading up to the telecom transmission station but never got the chance to try as I just could not find information on it. So after much research, I finally stumbled upon someone’s blog indicating the route up. This was my opportunity to reach the summit after some 8 years. I have to admit I almost gave up after some difficulty on the road. This time its not a matter of fitness but more the conditions of the road. Riding a 350kg bike with flat car tires is by no mean an easy feat on uneven roads. The fear of my rear tires digging into the mud crept into my mind. My selfishness made me ignore the possibility of fellow members not being able to go through the bad road conditions. I told myself, if I my heavy old lady can make it, the rest could. I guess we are all selfish at some point, I am no different. The adventure began with finally arriving at the entrance which lead to the ranger’s office. As expected, red laterite roads. This was easy although I knew its going to get bad if it rains. So we proceeded on and soon enough we came across the beginning of our trials on muddy roads. This was my first time on these roads and every inch was a new experience. After crossing our first hurdle, I decided to call the ranger to check if its going to get worse. He was not very clear about it but I guess its difficult to describe. He however sent a guide to assist us in. And so after some time a guide arrived and guided us to the ranger’s office. With his light weight bike, it was a breeze but not for me and my clumsy quarter toner! We proceeded on, taking some chances along the way and riding with half clutch most of the time. This is when bumpy course comes into play. It was a mix feeling between being like a kid on these roads just bashing through and like an adult ensuring safety. And so this went on for about 3-4 km but it seems never ending! Finally we arrived at the ranger’s office. 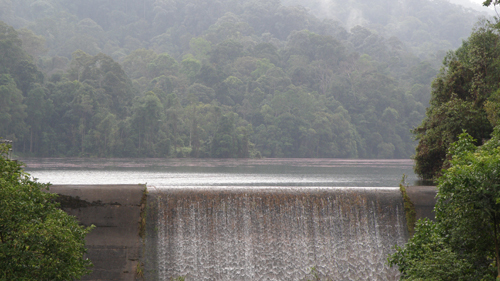 Here we saw the dam that I never knew existed! After a short rest, we registered at the ranger’s office as required before proceeding. 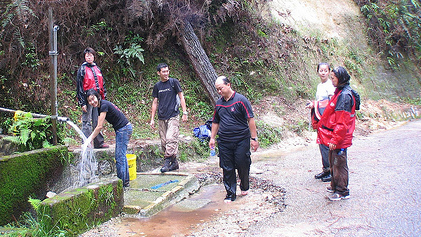 After registering, we were ready to proceed to the start point of the trek up to the summit. 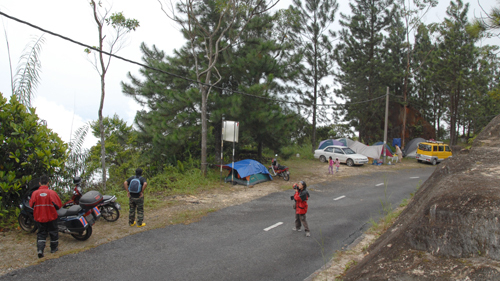 This stretch of road was much better as it is maintained by Telekom Malaysia. We stopped mid-way to take some shots as the view was quite inviting. Soon after we continued our ride up. After a few twists, we finally reached the campsite and parking grounds. We parked and shoot again! Well we have to sell the trip! Then its time for the main objective, reaching the summit. Thus we began our ascend. It was rather a mild ascend as it was not steep. The trek felt short because it was filled with surprises of the surrounding vegetation. They all looked like mega-bonsai with interesting orchids and pitcher plants. Then we reach the segment where we needed to use our four limbs. A combination of ropes, roots and even aluminium ladders aided our ascend. We finally reached the summit after 1 hour and 20 mins. As I reached the summit, something was just amiss and did not feel right. I did not feel the same as I did when I was at the summit 8 years back. Those of us who has been up here before concluded that its because we did not go through the pains of trekking from the base which would have been a grueling 7-8 hours. But nevertheless I was very happy to have made it up to the summit. Its like longing for someone and finally being with the person. So we enjoyed the moment whilst at the summit. 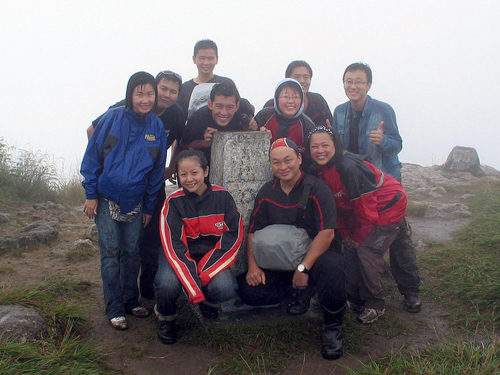 Unfortunately, the summit was covered with clouds thus we could not enjoy the view from the summit. After some moments of rekindling the past, we headed back down. Upon reaching our bikes we proceeded to a water point where we washed up. The running water was cold and refreshing. Reaching back to the ranger’s office we parked our bikes and took more pictures. But the mist was getting thicker and thus was not conducive for shoots. Now the dreadful moment of having to go through the bad roads again has arrived. Not having much choice as the daylight is fast coming to an end, we rode down. 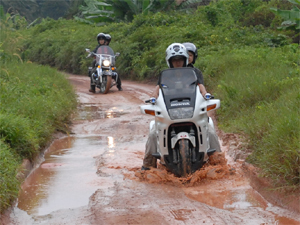 The first few kilometers were fine, then came the muddy patches. Due to the rain, now the patches were filled with water disabling us to gauge the ground conditions. Being the first bike I had no choice but to proceed. With much care, I went through ditch after ditch but my luck ran out. The old lady slipped and tipped on its side. With aid from Tony and Kenny, I got back on track and rode on. All of us took some sort of spill except for Tony. 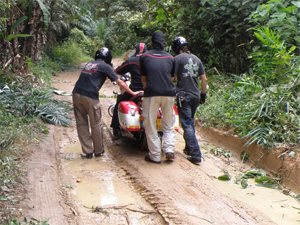 After several muddy patches and unknown ditches, we all pulled through with mud on our bikes as well as on our boots. We were all happy to have cleared the muddy roads and finally come to paved roads. Failing to come across any car wash as we had hoped, we settled for a self wash at a petrol kiosk. Then a meal that all have been waiting for since 11am, dinner! We were rather cautious about ordering seafood as the cost can be unpredictable. To our amazement, the bill came up to only RM138 for the 10 of us! So we happily paid and made our journey home after a long and taxing adventure! In the end I think although we had gone through one of the most difficult trips, it was one of the most rewarding in terms of experience and adventure. And so, we are extending it to our members in September! So if you are up to it, join us for our September Kruzer Kamp II …… for Ride, Experience and Slack.